So. Last month when my friend Leslie and I were tossing around what we should make for she made, ella hace this month, she suggested Pastel Azteca. Huh? I had never heard of it before. But if you know me at all, you know that alone was enough to make me say YES! I love making new-to-me dishes and trying new foods. Plus, Leslie said it was a favorite meal of her family's. And since one of the reasons I wanted to team up with Leslie every month was because we had such similar taste in food, I was pretty sure it would become a favorite around here, as well. So, it was on. Pastel Azteca in the very near future. 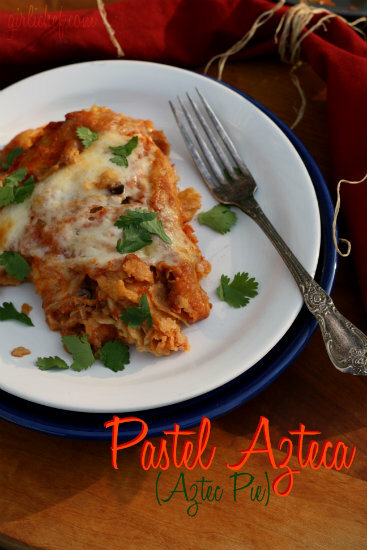 So I began searching and scouring and trying to located recipes for Pastel Azteca. I had some luck. But not as much as I would have thought. Until I came across a site that also referenced Pastel Azteca as Aztec Pie. So I searched Aztec Pie and BAM! (Sorry, that's so Emeril.) All sorts of results. It was basically what I expected since Leslie had described it as sort of a lasagna-style dish, the tortillas taking the place of the noodles. 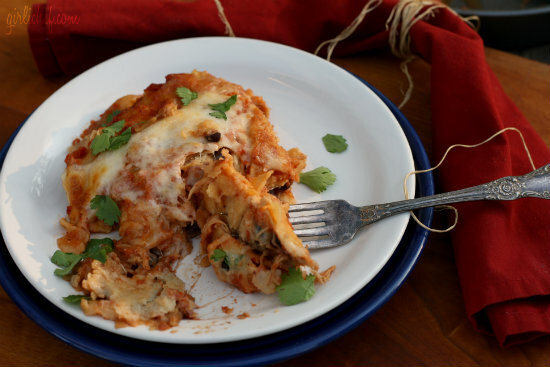 It's almost like a cross between lasagna and chilaquiles. I found versions with shredded chicken and corn tucked between the layers of corn tortillas and enchilada sauce. I found other versions with fire-roasted poblanos chiles blended with tangy tomatillos and cool sour cream separating the layers. I didn't know which version to start with. So I decided to go with one of my own. I had a container of shredded pork beckoning me from the fridge from a loin that I'd let cook all day in the crockpot a few days prior. I didn't have any corn in the house like I'd seen tumbling out of so many layers, but I'd recently made some black beans. And I like black beans with pork, so I decided to tuck those in, as well. Paired with some melting Queso Quesedilla, I figured I'd give my first try a go. Oh. My. Lawdy. The layers of goodness infused with a simple, yet flavorful sauce and gooey, melted cheese? That right there is some comfort food we could all enjoy! And I recognized the taste and texture. I had heard of Pastel Azteca before. Only growing up, we called it tortilla casserole or enchilada casserole. Well, duh! I'd forgotten all about it. I'm so happy that Leslie suggested this! And now I really, really want to try her version! Her sauce is more enchilada-ey than mine...two different types of chiles blended with sour cream to make this deep, brick red liquid. Yeah, my mouth was completely watering when I saw hers. Plus, I really want to try a verde (green) version using those roasted poblanos and tomatillos I mentioned. Again with the sour cream. I couldn't be happier that Leslie reminded me of this dish that I grew up enjoying. And now my kids will get to do the same thing! Place the tomatoes and their juices in the jar of a blender. Roast the onion and garlic cloves under a broiler until charred in spots. Add to jar of blender. Blend to a smooth puree. Pour into a medium-sized pot. Pour chicken stock or broth into the blender jar and swirl it around to get all of the juices off the sides. Pour into pot, as well. Bring to a boil, then reduce heat and let simmer ~10 minutes. In a 9" cake pan, spread four of the fried tortillas. They will overlap. Scatter half of the shredded pork (or other meat) over the tortillas. Spread half of the black beans over the pork. Ladle ⅓ of the sauce evenly over everything. Scatter ⅓ of the cheese over that. Repeat layer exactly as above. Top with remaining four fried tortillas, remaining sauce, and remaining cheese. Slide into preheated oven and bake for ~25 minutes or until golden and bubbly. Let sit for 5-10 minutes before slicing and serving. Serving Suggestions: Serve with a big dollop of sour cream, a scattering of cilantro, and a crisp green salad on the side. Oh, and a cold cerveza to wash it all down. Feel free to change up and/or add to the fillings. Substitute the shredded pork for shredded chicken or beef (or leave out the meat all together). Add to or replace the beans with another variety or with corn kernels. Scatter thinly sliced onion or roasted, chopped poblano chiles between the layers. You could also make a green sauce/salsa. Make it your favorite! I hope you'll head over to Leslie's place to check out her version of Pastel Azteca! This pasta dish looks so tempting! Yummy! Lawdy, Lawdy is right - that looks so ridiculously delicious! Oh man, I'd eat a big ol' plate of that for breakfast - insanely delicious, Heather! This looks insanely good, I happen to have shredded chicken in the fridge and everything else to make this so it may just have to be dinner tonight! Thanks for sharing. I can just imagine the melting texture of this, I'm so excited to discover another classic comfort food, thanks Heather! Cheesy goodness. Wish I could eat spicy food...looks great! Yumy!!! quiero, qué rico se vé!! Whenever we have family party we always make 3 trays of Pastel Azteca, the kiddos call it childa casserole, lol!! Your version looks amazing and Leslie's had me licking the screen. Thanks for sharing..missed your blog, been offline with my move and I think I am all caught up. Had chilaquiles, chocolate bacon cake, shrimp ajillo and a margarita. You rock girl!! Wow, that is one good looking pie! When I saw the picture, I thought they were chilaquiles. I've never heard of Aztec Pie, but it looks delish. I like that it's made in a pie pan, too... not so many leftovers for us. 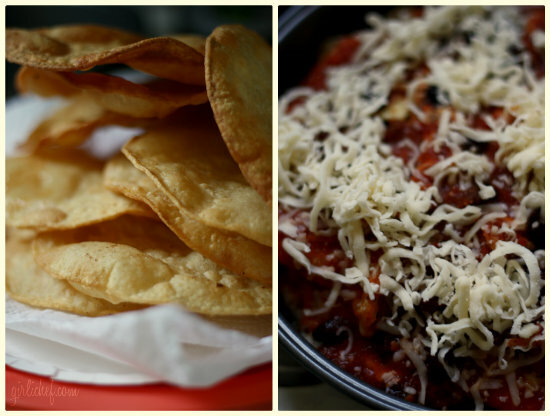 we love tortillas always and this pastelook delicious, nice pictures Heather! I know, they are very similar to chilaquiles...just a bit more "broken down" (ie soggier, lol). I thought a pie pan would be a good idea, too. I made a smallish batch since this was my first go-round with it! I'm always ready and willing to tackle a new recipe so I definitely want to try this! 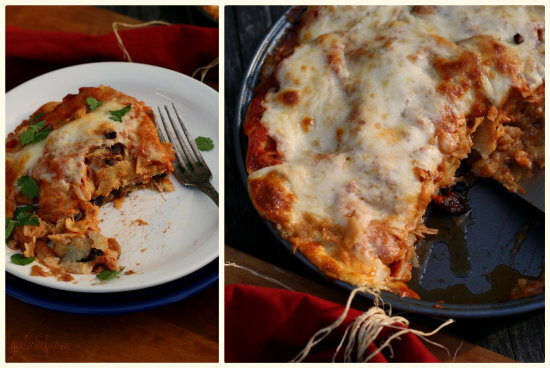 Anything that resembles lasagna in any way HAS to be a good thing. I never heard of this before either but it sounds unbelievable!!! Lawdy is right. I've got to try this one. Never heard of it either but I 100% have to make this, I love the crispy tortillas in there. I just said last night I needed to find something to make this week that would use some of the pulled pork we have in the freezer. This fits the bill. Well, I love chilequiles and I love lasagne ... so this is a no brainer. I love that there are so many ways to put this together. Yum!! I totally want this now after looking at both your versions. This is so something that I would eat for days - make a big batch and hoard the leftovers! Hi Heather!! Quick question: Why do you fry the tortillas until crisp instead of just passing them through the oil??? Thanks and congrats on your amazing blog!!! Hi Gloria. Well, to be honest, this was my first time making Pastel Azteca...and all of the recipes I found for it did it this way. I suppose you could think of it more like chilaquiles than enchiladas... I imagine you could try it by passing them through the oil, though. I don't see how it could hurt. Oh, you know...I think usually it's made with chips as opposed to whole tortillas, so I suppose that could be another reason. Sorry I couldn't give you a more decisive answer. Looks marvelous! Can't wait to try it out! Definite winner!